Blue Water Holidays is the UK’s leading specialist in small ship cruising, boating and touring holidays. Based in the picturesque market town of Skipton in the Yorkshire Dales, our team of friendly experts has been booking the right holidays for our discerning customers for over 17 years, offering a wealth of experience and knowledge to ensure customers get the best value for money. As the UK’s leading agents for all major river cruise lines and small ship, luxury and sailing cruises, we offer unique cruises and exclusive discounts. Visit our award-winning websites to find thousands of cruises, the latest special offers, unbiased advice, customer cruise reviews, detailed deck plans and images for thousands of river and small ships. Our Escorted Tours website features the most comprehensive collection of guided tours from the world’s leading companies. We offer a fantastic range of tours including small groups, solo travellers, family adventures, cruise tours and rail journeys. We also offer the best collection of self-drive boating holidays in the UK and Europe, with thousands of boating holidays available from bases all over the UK, France, Portugal, Canada, Ireland, Holland, Italy, Germany and Poland. 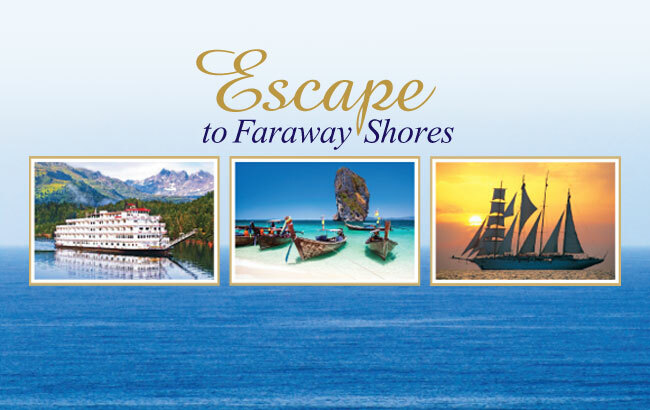 Escape to Faraway Shores Brochure! We have just released our superb Escape to Faraway Shores brochure, featuring a selection of exotic river, small ship and luxury cruises, all with fantastic offers. Traditional no-fly cruises from the UK 2020. Book now and second passenger cruises free! A unique 20-night voyage from just £7799pp – save up to £3300 per cabin! ABTA and ATOL bonded for your protection, you can trust Blue Water Holidays to find and book your ideal small ship or river cruise holiday. Call us on 01756 701199 (+44 1756 701199 from outside the UK) to embark on your cruise experience!